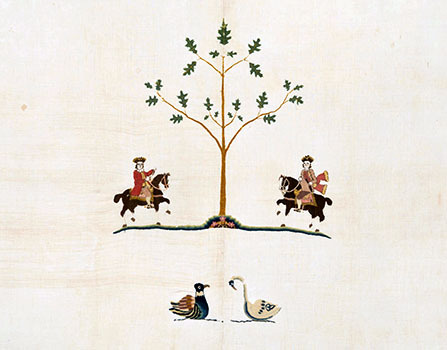 Needlework made in colonial America is indebted to England, by way of India, for its rudiments of design, in particular, the progressive adaptation of tree motifs found in crewelwork. The symbolic Tree of Life, associated with Indian palampores and incorporated and adapted into seventeenth–century English crewelwork, has evolved on this American piece into an oak tree. This motif is perhaps a reference to the famous Charter Oak in which the Colony of Connecticut's royal charter was hidden in order to escape confiscation by agents of King James II in 1687. Although felled by a storm in 1856, it remains an enduring symbol of liberty (the state tree is the white oak). 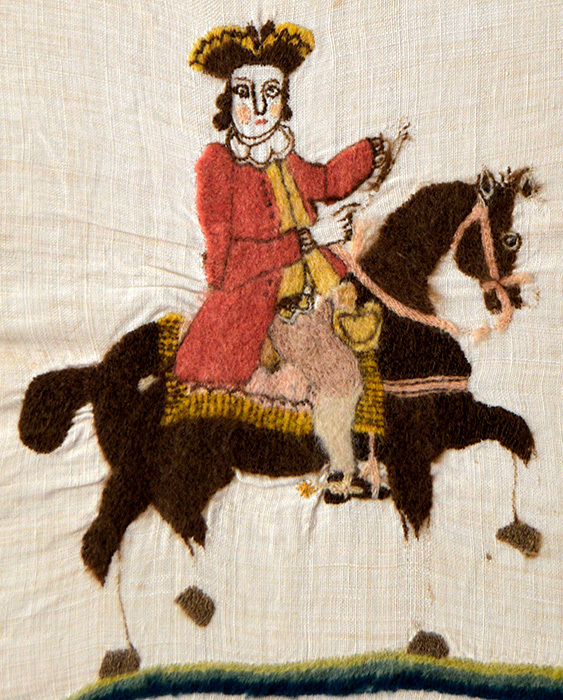 The mounted figures may represent colonist Joseph Wadsworth, who supposedly spirited the document away, and Governor–General Sir Edmund Andros, who was sent by the king to retrieve the document. This hanging is published with more information in the Cora Ginsburg 2016 Catalogue.